Fashion has always been a great way to express your individuality. 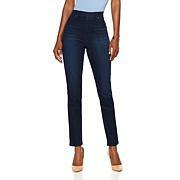 And denim is providing ample opportunity to do just that through cool designs like these studded tuxedo stripe jeans. The elongating effect is flattering, while the pop of metallic adds just the right amount of edge and attitude. Style fabulous. fit wonderful. Rock n Roll! Love DG2 Jeans! I love these jeans. Everytime I wear these people want to know where I purchased these beautiful jeans. I always mention HSN & DG2. I have many, many pairs of her jeans. I have gone from size 14 to a 12 in her jeans. In these jeans however I can wear a 10. These jeans are lovely. I own MANY DG2 jeans and aside from the beauty in the details on these particular jeans, the fit is PERFECT. Im 5 ft. 8 inches tall, size 10. I ordered 10 tall. 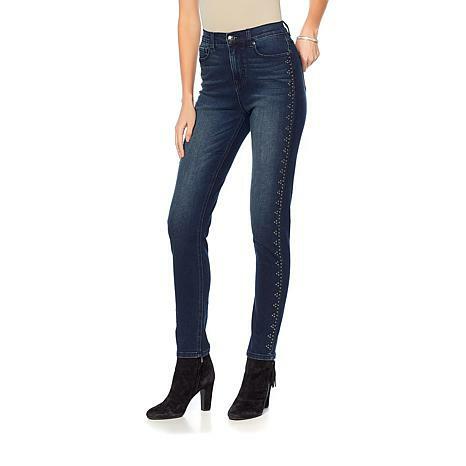 Overall, what I love about all DG2 jeans is if you fluctuate between sizes due to menopausal weight gain, as I do, your regular DG2 size will conform to your shape due to the versatility of fabrication, whether its the classic or virtual stretch. Im 50 and slender but my weight is a roller coaster now. 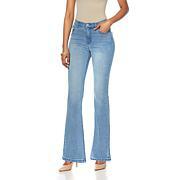 Of all Diane's jeans, her virtual stretch are the most comfortable and fit the best. I am between an 8 and a 10 and can wear an 8 or a 6 in the virtual stretch depending on whether I am looking for comfort or for a slimmer look. I bought the green. It is not the olive I am looking for but they are so great looking with the studs I kept them anyway.